The theme for our 2019 4th of July Celebration is “Forever Proud”. The Tooele City 4th of July committee would like to invite all businesses, church groups, schools, families, etc., to build a float for the 4th of July parade this year. What a great way to show your support for the community in which you live and do business! We will begin taking Parade Entries online beginning May 1, 2019 through June 21, 2019. Parade entries will also be taken in person at our Parks and Recreation Office. Park Vendors must register in‐person. We will begin taking in-person registrations May 1, 2019 through June 21, 2019 or until all vendor slots are filled. Registerat Tooele City Hall (90 N.Main St., Tooele) in the Parks and Recreation Office. 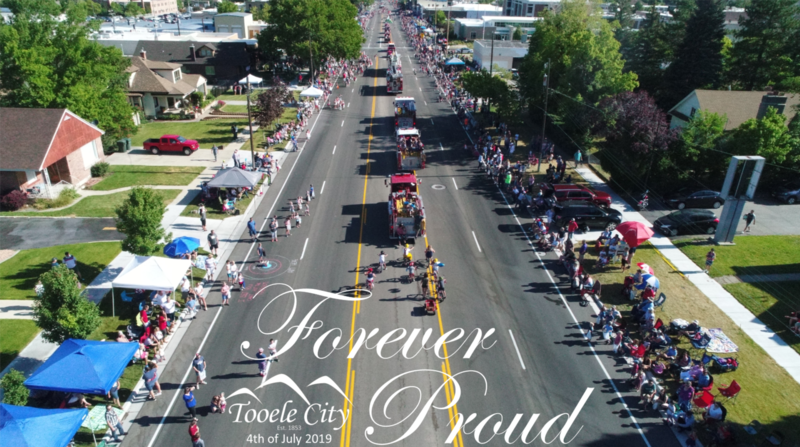 > Tooele City’s 4th of July Celebration 2019! For more information please contact the Parks & Recreation Office at 435.843.2143 or Terra Sherwood at 435.843‐2142.